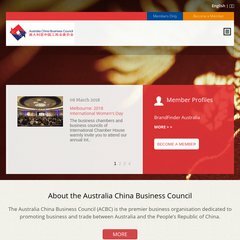 Topics: Australia China Business Council, 中文, New South Wales, Queensland, and Northern Territory. The estimated 101 daily visitors, each view 2.10 pages on average. It is hosted by Netregistry Pty Ltd (New South Wales, Ultimo,) using Microsoft-IIS/7 web server. ns4.digital-tsunami.com, and ns3.digital-tsunami.com are its DNS Nameservers. It is written for ASP.NET language.